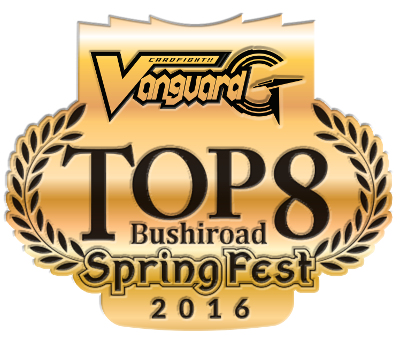 Bushiroad is proud to present Bushiroad Spring Fest 2016! 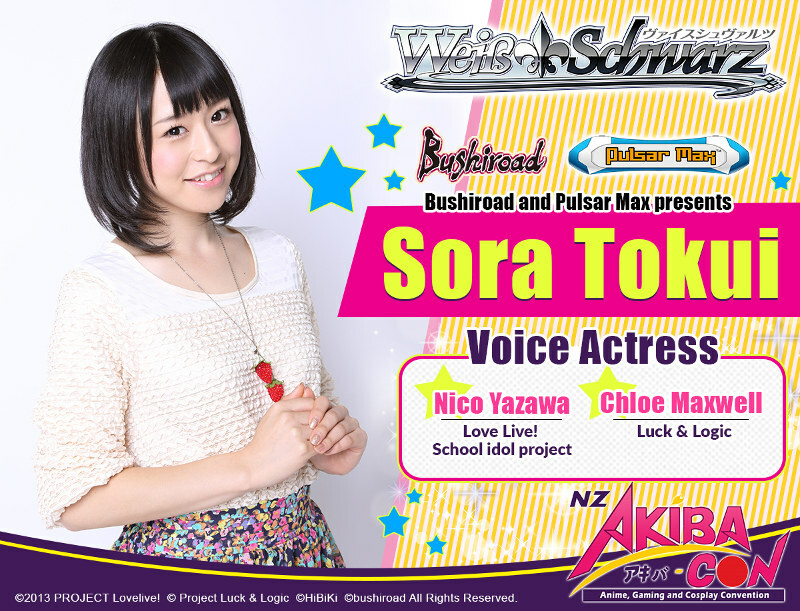 The event will feature all English Edition Bushiroad Trading Card Games, which includes Cardfight!! 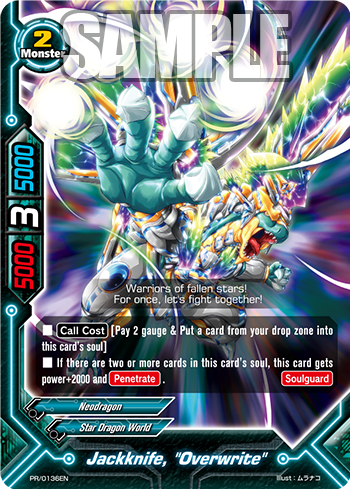 Vanguard Team League, Weiss Schwarz Neo-Showdown and Future Card Buddyfight Buddy Challenge. There will be no invitations to Continental Finals for Colombia Special Event. USA/Ohio Regional Qualifier: Badges to Origins Game Fair is required to enter the fair and participate in the event. Due to issues with the previous location, Bushiroad Spring Fest 2016 Malaysia Qualifier has changed its location to Dewan Cempaka, Cempaka Apartment Hotel (Level 3A, Tower 2) in Kuala Lumpur. The event dates remain the same. We sincerely apologize for the confusion and inconvenience caused by the change. Event schedule will be posted on a later date. In the wake of the tragic bombing incidents in Brussels, Belgium, we have contacted the venue and our partners in Belgium to inquire about the safety of the upcoming Bushiroad Spring Fest event on April 23, 2016. After serious considerations, Bushiroad has decided to go ahead with the tournament with the added precaution of basic security measures which we will implement at the event. Our primary concern remains the well being of the players and fans and we will continue to provide them with the best of care under the circumstances to have fun under safe and secure conditions. 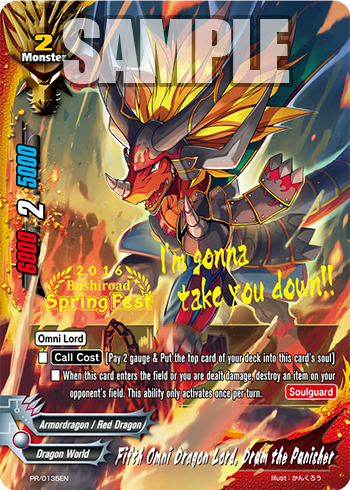 We appreciate your continued support for Bushiroad and thank you for attending the Bushiroad Spring Fest 2016, USA/Georgia (Atlanta) Qualifier. Bushiroad USA Inc. deeply and sincerely apologize to all players for not being able to provide everyone with an overall pleasant experience during the Qualifier. We understand that recent events at the Qualifier have evoked feelings of discontentment and disappointment in some players, which never should have occurred in the first place. Please rest assured that appropriate actions have been taken to ensure that such issues do not occur again in the future. We promise to strive for improvement and will work to our best to enhance your overall tournament experience from the next Qualifier onward. 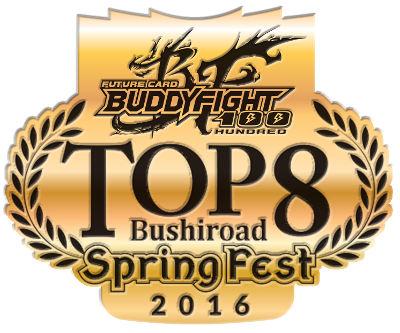 President of Bushiroad USA Inc.
Due to scheduling difficulties, the Bushiroad Spring Fest 2016 Spain Regional Qualifiers is cancelled. We sincerely apologize for the oversight and any inconvenience caused. Cardfight!! Vanguard players from Spain are recommended to join France qualifier. In addition, Top 4 teams from France Cardfight!! Vanguard Team League Regional Qualifier will be invited to participate in Europe Continental Final, and Top 2 teams’ travel and lodging will be sponsored. To kick start Bushiroad Spring Fest 2016, Bushiroad PR Coupon campaign will be launched alongside with monthly shop tournaments for February and March periods in 2016! 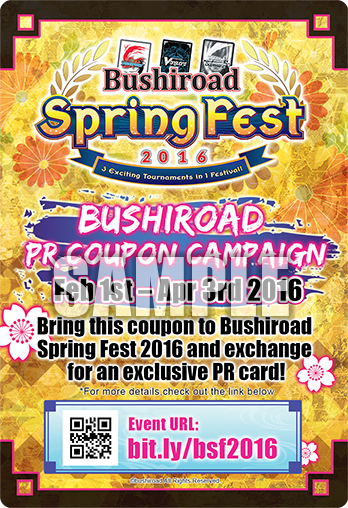 Collect Bushiroad PR Coupons and exchange for special PR cards at Bushiroad Spring Fest 2016! This year, the campaign has been extended to cover all three games! Collect Your Bushiroad PR Coupons! Fighters may receive more than one coupon if attending multiple shop tournaments during the campaign period. This is applicable to tournaments of all English edition Bushiroad products, including Cardfight!! Vanguard, Weiss Schwarz and Future Card Buddyfight. While stocks last. Redeem PR Coupon for the Special PR Card! 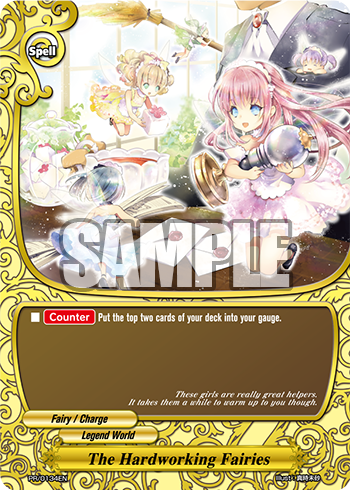 One coupon can be redeemed for one special PR card only, and may select from Cardfight!! 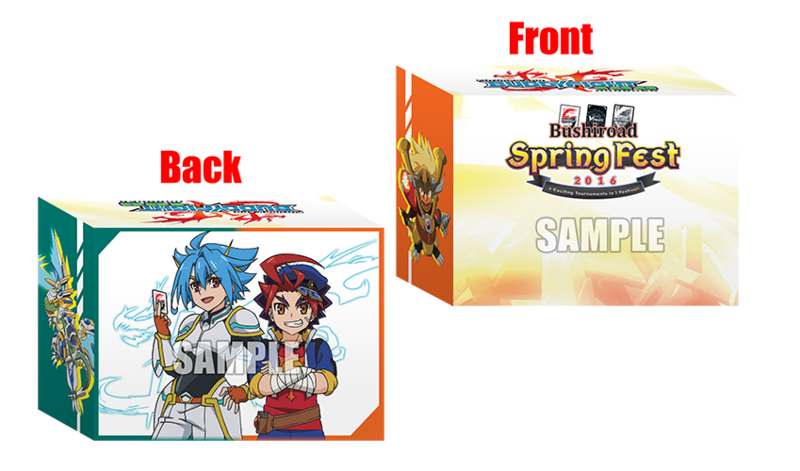 Vanguard, Weiss Schwarz or Future Card Buddyfight special PRs. 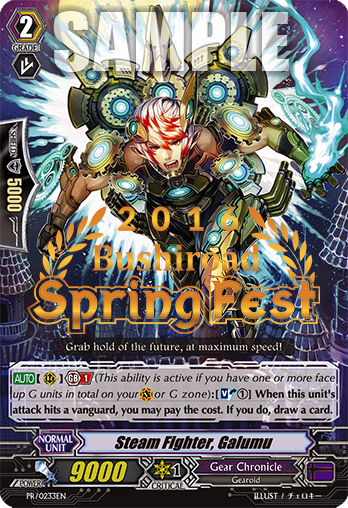 A maximum of 4 special PR cards can be redeemed per person per game at each Bushiroad Spring Fest 2016 venue. While stocks last. 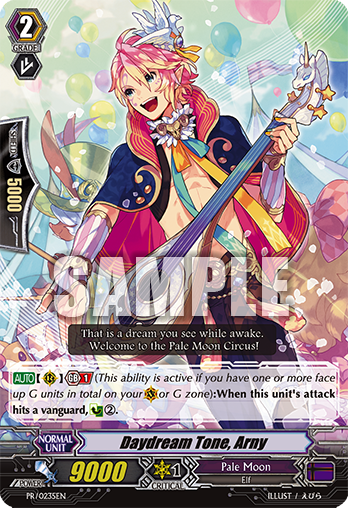 Keep the coupon and don’t forget to redeem a free PR/0233EN Steam Fighter, Galumu at Cardfight!! Online! 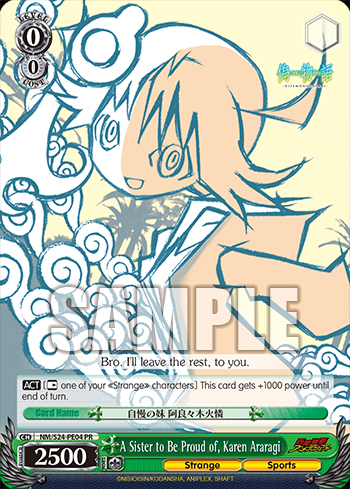 Available to redeem after the official launch of Cardfight!! Online. The serial code expires on Jul 10, 2017. 1 Bushiroad PR Coupon may redeem 1 of any PR card above at BSF2016. While stocks last. 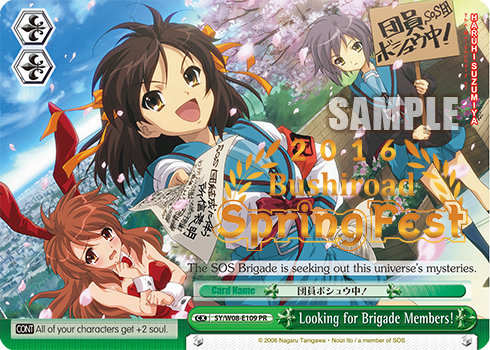 It is highly recommended to download the above deck registration forms for Bushiroad Spring Fest. Please kindly print out both pages. You may also use the registration forms for other events. 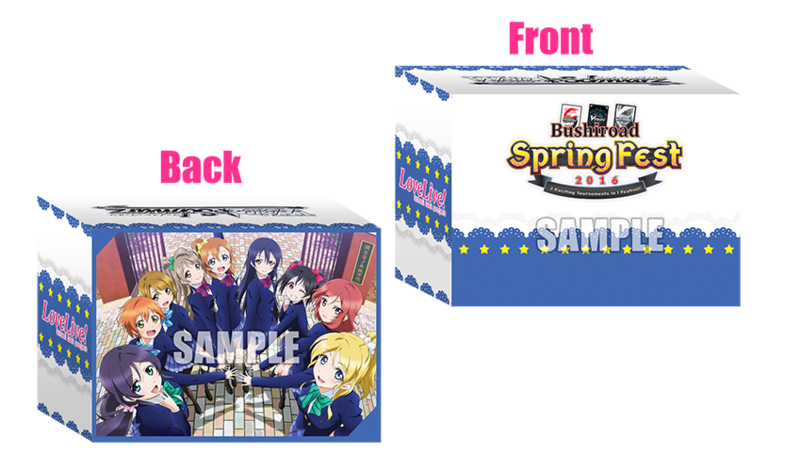 The availability of promotional goods at Bushiroad Spring Fest locations is subject to stock. While stock lasts. 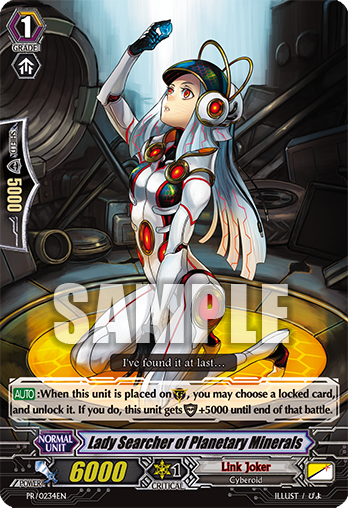 BSF2016 main tournament participant may receive 1pc of above-listed PR card and 1pc of above-listed deck case of the game he/she has played. The supply of the promotional goods is subject to stock. Deck cases will not be available at Colombia Special Event. Players who advance to Top 8 in BSF2016 main tournaments may receive a “Top 8 Pin” of the game he/she plays. Top 8 pins will not be available at Colombia Special Event. 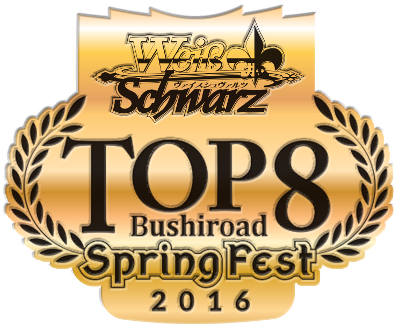 Finalists who achieve Top 4 in Bushiroad Spring Fest 2016 tournaments receive certificates of their respective positions and the game played. Top 3 finalists receive invitations to respective Continental Finals in their regions. Winner/winning team’s travel and accommodation expenses will be provided. Please refer to the details in the table below. Asia-Oceania Winning team, 2nd Place and 3rd Place teams will receive an invitation to the respective Continental Finals. Travel and accommodation expenses will be provided only to the winning team. There will be no invitations to Continental Finals for Colombia Special Event winning teams. The winner, 2nd Place and 3rd Place will receive an invitation to the respective Continental Finals. Travel and accommodation expenses will be provided only to the winner. There will be no invitations to Continental Finals for Colombia Special Event winners. Italy Winning team and 2nd Place teams will receive an invitation to Europe Continental Finals. The winner and 2nd Place will receive an invitation to Europe Continental Finals. Applicable to Germany and Italy only. Applicable to Greece and Germany only. France Winning team, 2nd Place, 3rd Place and 4th Place teams will receive an invitation to Europe Continental Finals. Travel and accommodation expenses will be provided to the winning team and 2nd Place Team. The winner and 2nd Place will receive an invitation to Europe Continental Finals. Travel and accommodation expenses will be provided only to the winner. The winner and 2nd Place will receive an invitation to Europe Continental Finals. United Kingdom Winning team, 2nd Place and 3rd Place teams will receive an invitation to Europe Continental Finals. Cardiff: Travel and accommodation expenses will be provided only to the winning team. Huddersfield: Travel and accommodation expenses will be provided to the winning team the 2nd Place team. The winner, 2nd Place and 3rd Place will receive an invitation to Europe Continental Finals. Cardiff: Travel and accommodation expenses will be provided only to the winner. Huddersfield: Travel and accommodation expenses will be provided to the winner the 2nd Place. The winner, 2nd Place and 3rd Place will receive an invitation to Europe Continental Finals. Huddersfield: Travel and accommodation expenses will be provided to the winner the 2nd Place. *Minors will need confirmation from a parent or guardian to earn the invitation to travel. If the winner is from the same city or town as where the Continental Finals is held, no accommodation will be provided. Invitation must be confirmed within 7 days in order to secure the invitation. Invited players are requited to arrange visa by themselves if necessary. Players who have received an invitation from a previous Spring Fest 2016 regional qualifier will NOT be eligible for another invitation. The invitation will be passed down to the next position if the winner has already received an invitation. More information will be revealed at a later date. Head to the event page for more details on NZ Akiba-con 2016. Location information is subject to change. The schedules will be announced on a later date. Origins Game Fair Badge is required to enter the game fair and participate at USA/Ohio Regional Qualifier. There will be no invitations to Continental Finals available for winners from Colombia Special event. 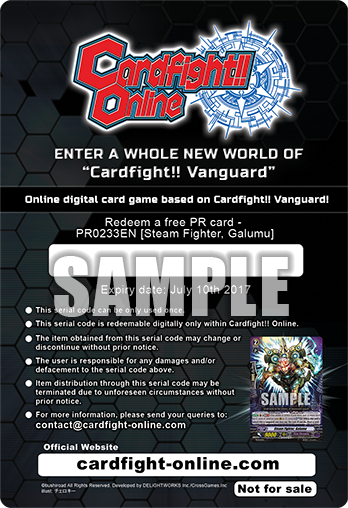 Special event participant may receive 1pc of “Steam Fighter, Galumu” (Cardfight!! 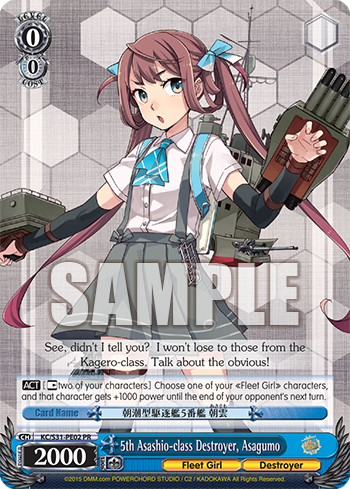 Vanguard) or “Looking for Brigade Members!” (Weiss Schwarz) PR card depending on the game played. The supply of the PR cards is subject to stock availability. Deck cases and Top 8 Pins will not be available for Colombia Special Event. Due to scheduling difficulties, BSF2016 Spain Regional Qualifier has been cancelled. We sincerely apologize for the oversight and any inconvenience caused due to the cancellation. If the qualifier is held inside another event or convention, entry fee to that event or convention may apply. North America: All fighters living in North America may participate. Fighters living outside of North America may not participate. Europe: All fighters living in Europe may participate. Fighters living outside of Europe may not participate. Asia-Oceania: All fighters living in Asia-Oceania may participate. Fighters living outside of Asia-Oceania may not participate. All English edition cards can be used. Cards of other languages may not be used. Each team member must use a different clan from the other team members within the team. Players may use sideboards in Buddy Challenge Best of 3 tournaments. Refer to “Sideboard Ruling” section for more details. Players must use the same Buddy and Flag throughout the whole tournament. Players cannot change the Buddy or Flag between games. Players can have 0-10 cards for their sideboard. Between games 1-2 and 2-3 of each round, players may use cards from their sideboard to change their deck. After sideboarding, the deck needs to be in a legal state and the sideboard can be no more than 10 cards. Players must return deck to pre-sideboard state before each new round. Regulations on language restriction, sleeving and eligibility of cards are the same as regional qualifiers. Clan Fight and Sideboard rulings are also applicable to Cardfight!! Vanguard and Future Card Buddyfight tournaments respectively at Continental Finals. Players still participating in the main event may not participate. Participants can go in and out freely during the Free Fight time. Fighters will be randomly matched against a new opponent after each match. Only English Edition cards may be used. All players participating will receive one PR card of the game played after 2 rounds. One player may receive maximum one PR card per game per day. We’re pleased to re-introduce the Event Collection option on our Bushiroad Online Shop! 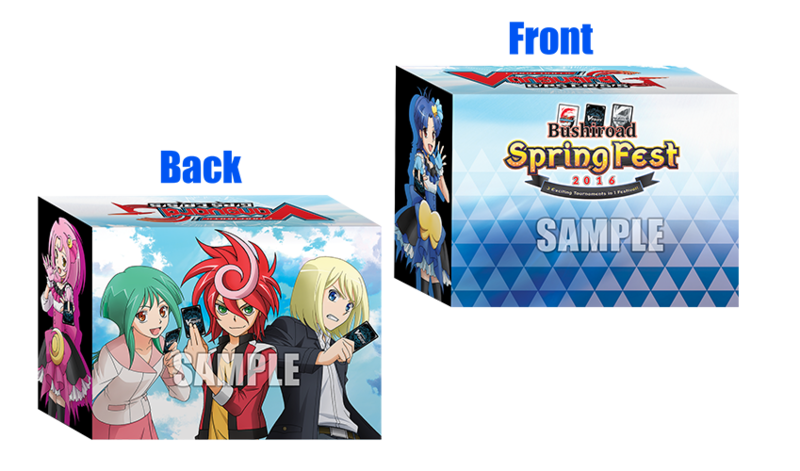 You can now collect your orders at selected Bushiroad Spring Fest 2016 locations! Pre-orders for Event Collection will open for a limited amount of time! Simply sign up on the Bushiroad Online Shop and spend S$100 or above to enjoy free shipping & handling!